4/7 Karla M, Morris, 37, of Galloway, was arrested by Ofc. William Kline for DWI, following a single vehicle accident. 4/8 Xzavier Lanten, 20, of Egg Harbor, was arrested by Ofc. Scott Winneberger for hindering arrest. 4/8 Michael Dambra, 25, of Egg Harbor, was arrested by Ofc. Patrick Neal for possession of CDS and possession of CDS paraphernalia. 4/9 Alexander S. Collarin, 36, of Blackwood, was arrested by Ofc. Vincent Ceci possession of CDS and possession of a weapon (club). 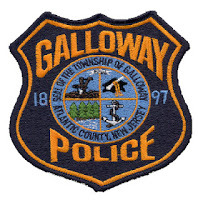 4/9 Bilal Salaam, 20 of Galloway, was arrested by Oft. Patrick Neal for theft, resisting arrest and eluding. 4/10 Santina C. Robbinson, 24, of Galloway, was arrested by Det. Ro Latoracca for receiving stolen property. 4/10 John P. Mooney, 49, of Galloway, was arrested by Det. Ryan Goehinger for endangering the welfare of a child. 4/11 Suzanne Wray-Cathey, 54, of Galloway, was arrested by Ofc. Kerry Baerman for DWI. 4/12 Shaun M. Jacoby, 21, of Egg Harbor Twp. was arrested by Ofc. Scott Winneberger for hindering arrest. 4/13 Anthonee Watford-Williams, 19, of Galloway was arrested by Ofc. Steven Garrison for possession of CDS with intent to distribute, possession of under 50 grams of marijuana and possession of CDS paraphernalia. 4/12 Albert S. Galimidi, 22, of Freehold was arrested by Ofc. Dan Weigel for DWI. 4/13 Anthony Collins, 37, of Franklinville was arrested by Ofc. John Mooney for hindering apprehension.